Every now and again sales will tank, sales will dive, they will be in the toilet. So, for this weekend challenge, here are some steps you can take for when that happens. Because if it happens, don’t panic, it’s not the end of the world, it happens to lots of people. 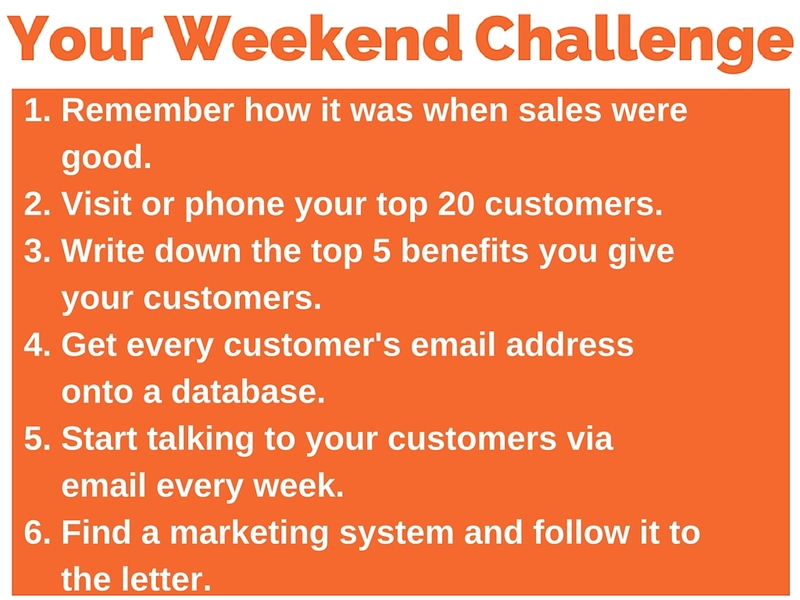 And here’s another little hint, here’s a trick, you can still take these steps even if sales are good, because they will improve good sales and make them wonderful. Okay, so you can go from bad to good, or from good to wonderful with the same tips. So before I get started, if sales are bad, one thing to bear in mind is that everyone always expects the person who is in trouble to be able to dig themselves out of trouble. So don’t worry, get help, ask people, get help. I mean, you can come onto my website and to get some free time with me. If you go to marketingforowners.com/freetime and you can book a twenty five minute free call with me and talk about anything. However, don’t expect me to miraculously save your business in twenty five minutes, because I don’t know who you are. But I certainly can give some pointers, so get on there. But anyway, ask for help, don’t just look to me, look to your chamber of commerce, look to other people that you may know in business; ask them what they think for their opinion. But don’t ask friends, don’t ask family, ask people who are in business. Step number one, write these down. Or of course you can go to marketingforowners.com/podcast because if you’re driving or doing something where you can’t write them down, because I don’t encourage it while you are driving. Honestly –sometimes you need a pick me up, you need some confidence, you need to get back in there, you need to get ready, to get fired up, you’re going to look to rediscover things, so just think back. Think “Wow, it was good before, so it may be bad at the moment, but I remember when it was good, I want me some of that.” Look forward to that feeling again. Number two, into action. 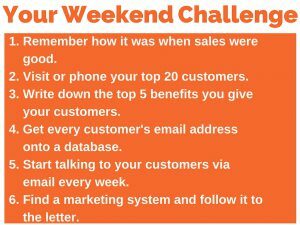 Visit, actually physically visit, or if you can’t do that, telephone your top twenty customers and ask them questions. Now when I say visit or telephone, visit is choice number one, telephone is choice number two, e-mail is not an option. Don’t be lazy, or if you want to be lazy, sales are really bad and you don’t want to put the effort in, then off you go, leave the room, because everyone else is listening, everyone else is interested, you go back, go get yourself a job because you’re not going to get far without the effort. So, ask questions, talk to them, communicate, ask them, how is business for them. Ask them a bunch of questions such as why do they buy from you? Do they know anyone else who could benefit from your service? Do they have any new products or services that they wish you sold? Is there anything you could do better? These are your top customers, they like you, they’re not going to say “Ugh! Go away.” They like you, that’s why we go to them and ask them questions, they can help you out. They like you. Did I say that? Now a benefit is not a feature. So a feature would be, for instance a feature is what car sellers say. So they say “Sixty miles an hour in ten seconds, fuel economy is this, it’s got heated mirrors, it’s got park assist.” Those are all features. Benefits are from the point of view of the customer, so when it’s got park assist, that’s a feature, the benefit to the customer is no longer do you have to be scared to try and park, parallel park in public, because this car will do it all for you and make you look like a pro. Do you see the difference? So find the top benefits, you’ve got some, you’ve got five, find them. Remember, you talk to the customers, ask them. When I say every customer ever, I mean ever. I don’t mind if it’s five years ago. And if you weren’t collecting e-mails, shame on you, you should have been, because e-mail is free. But get it on to a database, get into a spreadsheet and get as many as possible. If necessary, if you can’t do that, if it’s in some lots of strange files, go to fiverr.com, you know I’m always telling you about that and look up the data entry, you will find people who will do three hours of work for five dollars, which is about three pounds fifty; that is insane. Do it. Because once you’ve got them, you can go on to number five. And by the way, don’t give me the excuse of “Oh, I’ll wait until I have got them all.” Start immediately, get as many as you can and get on with it and then start adding the rest. That means weekly, once a week. You don’t have to wait to write it five minutes before it’s due to go out like doing your school homework, you can write two at a time. Remember, recently we talked about batching? Write two or three at a time. What can you talk about? Ooooh, let me think. What you do, who you are, why you are writing to them, etc., etc. an offer you’ve got, something new that’s coming up, something new you’re thinking of adding to the range. What do you think? Reply to me, let me know if you think this is something you’d be interested in, etc. And when you write that e-mail, don’t go all corporate. Write it like it’s a letter to one single person. Picture that one person, that ideal customer and write to them, don’t go corporate. I have seen e-mails from people, I have got a friend who writes them, he doesn’t try them personally, he used to employ someone who would write them, who wrote them in what appeared to me to be Shakespearean English, I couldn’t understand a word. It’s all grammatically super-duper, no one talks like that, I couldn’t understand what it meant, it didn’t get to the point. Just write normally. Yes, so let’s be blunt here. You have allowed, for whatever circumstances, it may not be your fault, but you were the captain in charge of the ship, same story it comes down to you. But under your watch, sales have tanked, so you need some advice and some help; honestly, we all do, we all do, not just you, we can all benefit from advice and there is nothing better than a proven, tried and tested marketing system. But when you use a proven tried and tested marketing system, don’t vary, don’t say “Ohh, that’s good, but I think I’ll just…” No, do it to the letter, it will work, it will work and you can outsource the tasks. There are many, you can speak to me, we’ve got our seven Ps, our perpetual sales cycle that just, once you set this stuff up, it just works 24/7 on autopilot. That’s how I built my businesses, that’s how I built this. But there are plenty others, get on Google, look them up. If you are not sure, if you’ve never heard, get on that call. Remember, marketingforowners.com/freetime. So that’s it, so that’s something for you to think about over the weekend. 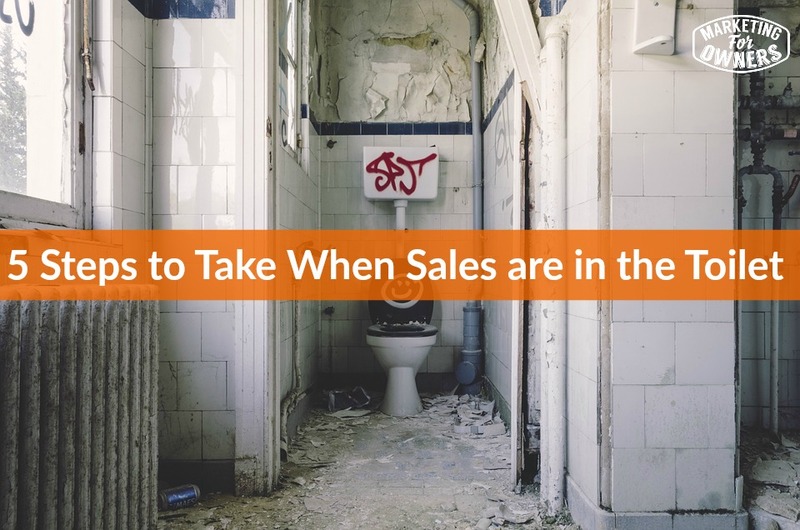 And remember what I said, you can apply these whether your sales are in the toilet or not. How cool is that? Anyway, have yourself a wonderful weekend. I am hoping that the sunshine keeps up and also hoping it warms up a bit here. I will be back and see you again next week.